Tales of vampiric creatures have been part of our culture for centuries. Often steeped in fantastical mythos, more modern fictional accounts strip away many of the incredible elements and try to fit the vampire into the realm of sci-fi. 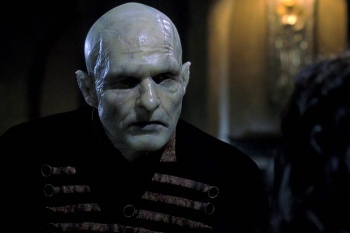 Guillermo del Toro and Chuck Hogan's upcoming TV series The Strain, based on their novel trilogy, attempts a very realistic approach to the vampire. While I won't say enough to spoil anything for you, it involves a virus, and the vampire's entire biology and physiology have been well thought-out. But let's build our own version of a realistic vampire, based on scientifically sound principles and what we observe in nature. We'll start with the basics: our vampire will be a living (not undead) creature - a mammal and cousin to the human. Perhaps we shared a common ancestor with the vampire, but we evolved along different paths according to a predator-prey evolutionary track. Let's call our race the homo vampiris. Let's toss out the notion that vampires burst into flames once exposed to sunlight - that has far more to do with the mythos of vampires being evil and thus destroyed by something seen as pure, holy, or "good" as the Sun. Instead, let's consider the fact that the Sun is actually harmful to most creatures, given the right conditions. Humans around the world get sunburned every day, and millions contract skin cancer every year as a result of UV exposure. What is a sunburn? Though we often don't think of it this way, it's actually a radiation burn that causes cellular damage. The Sun is constantly bombarding us with deadly ultraviolet radiation, and the Earth's ozone layer filters out most of this harmful light. But what about the radiation that makes it through? The vast majority of it is dissipated by melanin, the pigment that gives our skin color. People with darker skin tones - that is to say, more melanin - have been found to be able to handle sun exposure better than fair-skinned people, who tend to burn more easily. But what if someone didn't have any melanin at all? That condition is known as albinism, a disorder that a person or animal is born with and is passed down genetically. In albinos, even the irises of the eyes lack pigment, which is why they appear red: you are seeing straight through to the retina. Normally, the iris contracts and expands to let more or less light in - this is why your pupils appear dilated in dim light, but much smaller in bright light. In the case of an albino's iris, since it is transparent, it cannot effectively block the light entering the eye. Because of this, albinos tend to have difficulty seeing in bright light, and many even experience discomfort or pain. So the first trait we'll give our homo vampiris is the genetic condition of albinism, which grants them pale skin, white hair, red eyes, and an extreme aversion to sunlight.